The 20th-ranked Sooners are 0-3 in the last three trips to the Erwin Center. Sugar Bowl champions to be honored during halftime of Texas-OU prime-time matchup. There’s one bankable fact about Shaka Smart’s basketball teams at Texas. His Longhorns don’t get blown out. In 117 games in four seasons, Smart’s teams have lost by more than 20 points only twice — 30 points to Kansas (Feb. 29, 2016) and 35 at West Virginia (Jan. 20, 2018). In Smart’s 57 losses at UT, 22 have been by double digits. The close ones haven’t gone UT’s way, though. Thirty-one games — more than one-fourth of Smart’s total — have been decided by one, two or three points. Under Smart, Texas is 13-18 in those situations. Smart is 60-57 overall at UT. The Longhorns (10-7, 2-3 Big 12) find themselves drifting back to .500 territory again this season mostly because of late-game execution. Courtney Ramey didn’t get a clean look at a game-tying 3-pointer against Oklahoma State, and Febres rushed a potential game-winning shot Monday at Kansas. Six of UT’s seven losses, including these last three, have been decided by six points or fewer, essentially two possessions. In a 40-minute basketball game, that’s nothing. So instead of being at or near the top of the Big 12 standings, the Horns are mired toward the bottom. Texas needs to get up big Saturday against No. 20 Oklahoma (13-4, 2-3) and not let off the gas. “We’ve been talking about finishing games,” senior Dylan Osetkowski said. “I think the biggest thing is just continuing to realize that we’re right there. It’s just two or three possessions, little details throughout the game that we just really need to clean up, tighten up. I think once we do that, things will start to take care of things themselves. Smart stressed the importance of finishing games all throughout the offseason, but it’s still a primary bugaboo. Last season, UT was 8-9 in games decided in the final minute or overtime. End-of-game situations are when you sweat the details, stiffen up on defense and hit free throws. 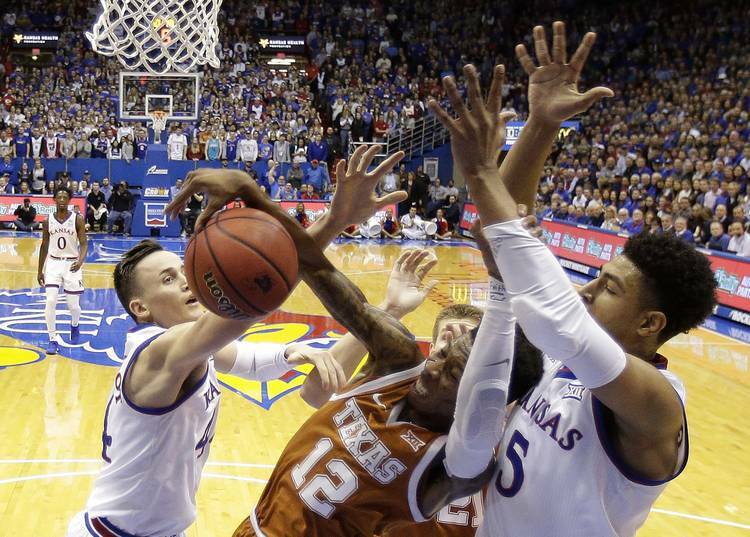 On Monday at Kansas, the game’s final play was emblematic of an inconsistent team. Trailing by two, Smart wanted guard Matt Coleman III to penetrate the lane and either throw it back to Febres for a 3-pointer or find guard Kerwin Roach II in the right corner. Instead, Roach drifted up the floor to the wing because he thought the Jayhawks would press and Coleman would be in trouble. It clogged up the spacing. Febres had time to collect himself, but he rushed a shot that was off the mark with two seconds left. Texas lost 80-78. Chalk it up as a hard learning lesson. Now the Horns must move on. Oklahoma is coming off a surprising 74-61 home loss to Kansas State. Smart is 3-0 against OU coach Lon Kruger in Austin even with superstars Buddy Hield and Trae Young in tow. The six Texas-OU games over the last three years were decided by an average of 6.2 points each. Again, essentially two possessions. If Saturday boils down to a one-possession finish, it’s unclear how things will pan out for those in burnt orange.